The New Disease was something akin to a retirement project, alongside some expanding of horizons. I haven't really put the work into it I could (call me easily distracted), but it is slowly taking shape. Essays Includes new work on the Tippit case, the Texas Theater and why Oswald should be taken on by the Innocence Project. All can be read online or downloaded. The ROKCBlogster My personal blog on any subject. 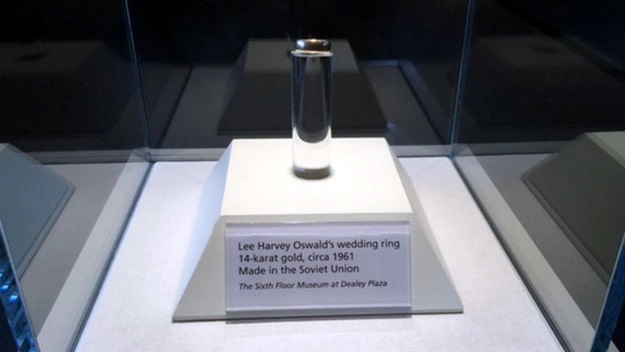 Includes what I believe is an important exposé on the provenance of the ring now on display at the 6th Floor Museum and claimed to have been Lee Oswald's wedding ring. It is not, and this explains how the fraud came about. Crappy merch What the hell, right? 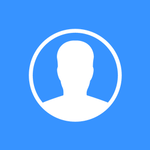 Forums - various topics and leftovers from unfinished, broken and dangerous endeavors. Humor -only partially completed tribute to "Harvey & Lee"
Collections - at the moment, Junior Jatman's HSCA transcript and a fraction of John Woods' photo collection. A lot more to do in this section. FAQs - so far, just one -on Prayer Man - again, a lot more to do here. edit one more added. Also for 2019, I want to get back to work on my book, work on more film scripts and finish our ROKC WIKI. Given my procrastination and easy distraction, I'll call it a victory just to get some of this done. The only good disease is The New Disease. The FAQ link is not working. I like the triangulation of Lone Nutters, Conspiracists, and the Facts. Sets us apart, makes us unique. As usual Stan, you get it. The distinguishing difference for all three theories, 2FE from 6th Floor, 2FE from First Floor, and No 2FE, is the photographic evidence that is the genesis of two out of three of them. At least we have the clearly human figure, unaccounted for, and looking like LHO going for us. In Decker's Curry's famous words (and Hoover's for that matter), no one can put LHO in that window. At least we can point to photographs. Talk about best evidence! Case in point with some of the threads at EF lately. barto wrote: Case in point with some of the threads at EF lately. Jake Sykes wrote: The distinguishing difference for all three theories, 2FE from 6th Floor, 2FE from First Floor, and No 2FE, is the photographic evidence that is the genesis of two out of three of them. At least we have the clearly human figure, unaccounted for, and looking like LHO going for us. In Decker's famous words (and Hoover's for that matter), no one can put LHO in that window. At least we can point to photographs. Talk about best evidence! You mean Curry,not Decker. 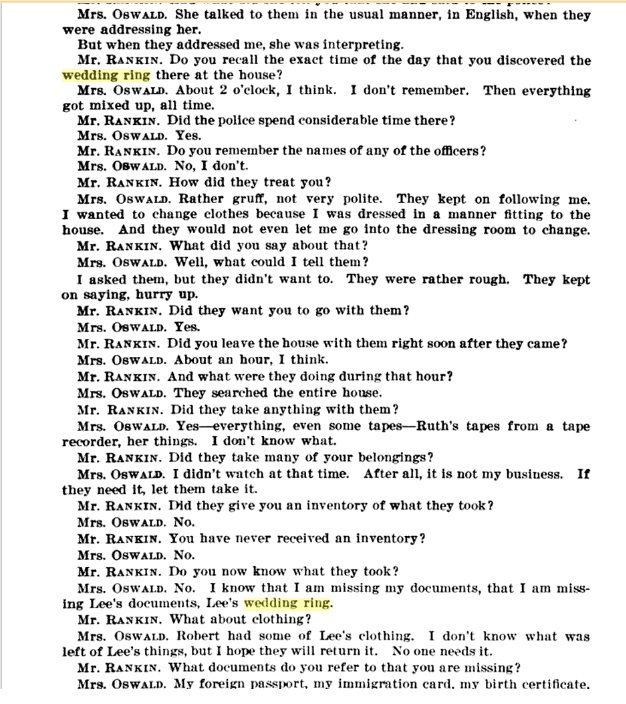 Curry said "We do not have any evidence that Oswald fired that rifle and never did. Nobody has been able to place him in that window with that rifle yet." Thank you Vinny. I will edit that now that you have pointed it out. More info so have created another post on the ring. I would put it as now beyond reasonable doubt that this a case of fraud - started in late November 1963, claiming Marina's ring was Lee's to help incriminate him (why else would he leave a ring he never took off? It was a symbolic gesture! He knew his marriage was kaput and he knew he had to kill Kennedy to prove he was still a man). That fraud paved the way for eventual sale of Marina's cheap band as Oswald memorabilia. “First, we removed the rings on the corpse’s finger and gave them to Marina… Back in the autopsy room, before Oswald’s new casket was closed and he went back into the damp earth of Rose Hill, a grateful Marina gave Dr. Norton an odd gift: the red gemstone ring we’d taken off the corpse’s pinky. It was her way of saying thanks for the team’s work. But Linda was visibly uncomfortable with this morbid reward. As soon as Marina left the room, she inconspicuously slipped it into my hand. She didn’t want it. Neither did I. As well-meaning as it might have been, it was a sordid souvenir of a grim task and an even grimmer history. I wished for the whole wretched mess to just be buried once and for all. So just before they sealed Lee Harvey Oswald’s coffin for his next eternity, I dropped the ring into the box with him and then drove home to San Antonio in the dark.” (Morgue: A Life in Death by Dr. Vincent Di Maio, Ron Franscel, pp 114-122). I want those involved to come after me. I dare them to. Outstanding work on this, Greg. And you're quite safe. The payoff is that the 6FM paid top dollar for a cheap trinket and can't afford to say otherwise. Or you can dare them to. A gold wedding band and a red stone ring were removed from the fifth digit of the left hand (subsequently identified by Mrs. Porter as representative of items placed upon the body at the time of initial burial). Yep its a Russian ring alright... does this authenticate Lee's ownership and wearing of said wedding band. I am guessing that the acrylic post is sized accordingly for Oswald's ring finger. Does his wedding band look too wide to work in? Ed. Ledoux wrote: Does his wedding band look too wide to work in? This photo blows one part of my theory - that he was married in his Marine Corp ring. The only photo showing a ring I had found was the one with them leaving Minsk and it is impossible to say what that ring is. Clearly though, this is not his Marine Corp ring. She also gave conflicting accounts. She did notice it when she got up. She never noticed it until the cops came. Meanwhile for a short time, the official story was that the Secret Service picked it up on Dec 2 and delivered it to her on Dec 30, 1964 - after this testimony was given. That actually fits with her NO Grand Jury testimony that she still had it "somewhere" - though couldn't answer when asked if it was inscribed. In any event, the official story got changed. In the new version, it was picked up on Dec 2 and delivered to an unnamed lawyer representing Marina. Of course, Marina also testified that she phoned Ruth on Nov 24 telling her she needed some things - including that ring. The unstated text is that she wanted it for the funeral and Ruth testified that the ring was picked up by FBI agent Odum - someone she knew very well, so it was not a Secret Service agent she mistook for FBI. 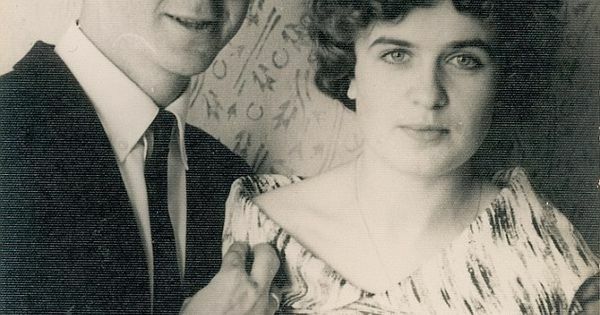 In short, that ring on her dresser got to Marina in time to be put on Lee's finger - and was too small to have belonged to Lee. Officially Lee's ring is with the Secret Service for over a year and then given to a lawyer, not Marina. I find it entirely suspicious that the Secret Service versions never include anything about Marina ASKING for the ring to be picked up. If they admitted that, then they would have to explain hanging on to it for so long and giving it to someone else after , not her. My problem now is, your photo seems to indicate Lee did buy himself a wedding ring, and if it is not the one on display - what the hell happened to it? 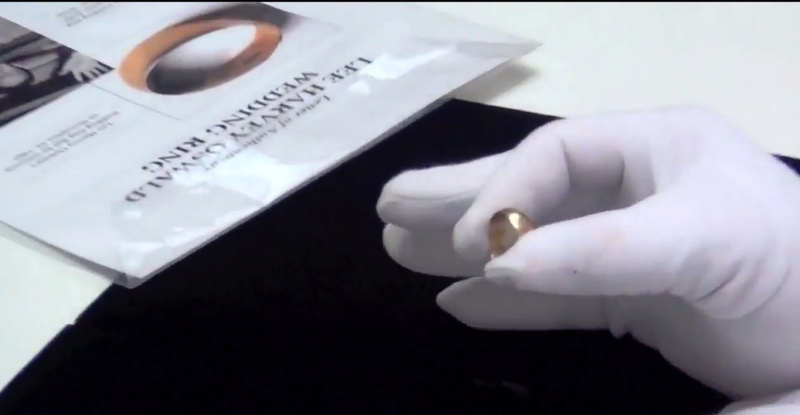 And what happened to Marina's ring that came out of the grave in 1981, but never went back in? Right now, what I have is a lot of conflicting statements and a measurement showing it is female size. The very frugal Oswald buys an engagement ring and two wedding rings in the space of 6 weeks. Amazing. That Minsk photo has me stumped. Thank you for this Greg! The Minsk ring looks quite thin, only a few mm. The oceanliner pic could be the Marine Corp rings band, and is wide, 6-8+ mm from what I can discern. Greg are there any photos of Lee in wedding ring from Dallas or NO that clearly show him in a wide wedding band. Secret Service doc that was sold with ring was just typed up, no signed signatures date etc... not exactly provenance. Your point is succinct, SS doesn't have a leg to stand on. OF NOTE: Its customary to borrow a wedding band for ceremony if you cant aquire them. It is also Bridesmaid and Groomsmans job to make sure rings are ready for the ceremony. Otherwise Lee would need to take Marina to jewelers to get ring sized or pick the correct size to fit her fourth digit. Sometimes rings are picked, given, then sized but Marina doesnt mention this at all. The purchase of engagement ring and two wedding bands in a short time period would be a financial blow to anyone. More likely a grandparents ring is used for the ceremony. If no similar pics of the Minsk band exist for Dallas/NO then rest assured Lee did not purchase and wear a wedding band. He borrowed. For film work I spin my ring around so it appears to be just a gold band.